Seasonal good wishes to all. As this year draws to a close and our Winter Solstice approaches once more, I am prompted to contemplate my own situation in relation to past activity and future plans. Both recent and prospective events are summarized in the next few paragraphs. These are followed by some further reflections in support of the work, inspired by the Solstice, on sensitivity, movement and timing. I hope this short piece, discussing how harmonious movement and global touch evolve in relationship with the still centre, will serve as a useful complement to my essay of last Spring (see earlier blog). Certainly, I have not added much to this blog in recent months, but I have been active in other areas, including the Seiki projects mentioned in my agenda pages for 2017. I am happy to say that these proved to be most satisfying experiences. My own residential Seiki course in the Alpujarras in September and the open Gathering of the European Seiki Group in November were both well attended, entirely interesting events that more than rewarded the effort invested. That organisational effort, I have to say, was offered with ample devotion and willingness by colleagues in the work to whom I and many others owe our grateful thanks. The work continues in 2018 and I have a number of workshops and longer courses planned. The first of these is in February, near Granada – a weekend devoted to the investigation of Healing Touch. Seiki encourages the widest view and the fullest exploration of subtle touch in relation to health and well-being that I have ever encountered. Kishi’s work provided a wealth of example and experience, but the practices need to be clearly outlined and explained for a new generation. The healing path continues; newcomers and past students will all be welcome. (Contact Maria Navarro: navarrodecastro@yahoo.es). Later in the year I hope for renewed contact with Seiki students in Madrid, and September holds the prospect of another Residential Course in the Alpujarras, the mountain retreat in Southern Spain, for further explorations of Seiki and Ki Culture. Thanks and best wishes to all. Below is my short essay for the Solstice, a comment on global touch and the harmony of the open way. In Nature, the Winter Solstice marks a quiet period of withdrawal and rest, a temporary phase prior to renewed activity, and this is surely pertinent to our own lives too in varied degrees. Allowing ourselves to relax physically is also refreshing for the mind – our thought wanders freely and inspiring new ideas can emerge. Contemplation as an inwardly directed mental activity is best achieved when outwardly focused effort is suspended, especially effort involving the physical body. We have another kind of vision that reflects our awareness of extended time and space. As a developed human-being, I can create ordered images of possible futures from selected impressions of my past experience that my nervous system has collected and stored. Normally, this corresponds to my person-centred and socially conditioned consciousness, but, as we have heard countless times, everything is relative. By going even more deeply inside, it is possible to experience things on a non-personal level. Our centre simply becomes one of universal feeling, extending outward to encompass everything which had appeared to be other. This is an essential stage in the ongoing exercise or journey of transcendence; a journey towards global awareness and another way of being in the world. In the process, I must put my ego-consciousness in the appropriate place. We do need to differentiate ourselves from the world to become authentic individuals, but it is the world according to our particular society that gave us our identity, and as the centre shifts we find there are as many ways to belong as there are to be different. Many distinct conscious entities share our world. In the small hours of the morning, when I am normally sound asleep, the owls and other nocturnal creatures are wide awake to their own version of the universe. Our calendar year is finishing, but only in the northern hemisphere is this period associated with Winter. In Australia it is mid-summer. Each person everywhere is navigating their own experience of life. In healing, there is a vision that both includes and transcends all notions of medicine and therapy, eventually dissolving the distinction between healer and healed. Our common aim is to enhance our appreciation of the sensory realms through which life is experienced, extending our awareness to become creative participators in this one great life that includes everybody and everything else. Thenceforth, our path can be one of celebration, surrender and service. But we must take care. Objectively, it’s one planet we share; subjectively, there are myriad versions of the universe. Pause for a moment to consider this: Of the five conventional senses it is only through touch that we connect directly with the living body of another to become subjectively and objectively merged in a simultaneously shared experience. Touching the periphery, touching the centre? Here are unique challenges, and profound opportunities for developing empathy and understanding. We should be painfully aware that trust has often been betrayed. We have been abandoned and abused. Our individuality, or our belonging, have been bought at too a high price; we are lost and confused so there is no centre we can feel. Very carefully then, we touch at the border, the peripheral senses become attuned. Slowly the vital centres awaken, and also feel. If we can relax, breath a little more freely, then a path can be found; the centres can be joined. Earlier this year, in my Spring essay, I wrote about essential benefits of simple, quiet, penetrating touch that originated in Anpuku, the Hara-to-Hara communication espoused by the early masters as the basis of Shiatsu. The roots of this were traced to the natural body-mind wisdom of the Tao and the practical, experiential philosophy of Zen. Further, the deep healing potential of of this way of touch was confirmed, we saw, when scientific investigation of the autonomic nervous system clearly showed that the para-sympathetic phase restores optimal conditions for organ function and general metabolism. This occurs when conditions of safety and calm are recognised through the senses. Finding a way to the “Gate of Origin” – coming home, the breathing changes. In treatment through touch, respectful sensitive contact, offered in an intimate, tranquil atmosphere, effectively provides the conditions best suited to this deep autonomous path of recovery. It is like feeling welcomed, coming home to ourselves by that “original gate” through which we can also set out afresh when the time is right. Whether this is within or beyond the medical domain is an open question, but there is no reason why subtle perceptions and techniques derived from medical knowledge should not be brought into the practices as appropriate. Even so, accepting the world as it is and “non-interference” form the basis of a harmonious life, one lived in accord with the Tao. From there we can develop the sensitivity and spontaneity that allows us to adapt. When conditions appear to present obstruction, difficulty and pain we do not need to diverge from Nature’s way, but to perceive it with more clarity. So begins the never-ending journey of conscious daily practice, which can include, if we so desire, the particular practices of body-movement harmony developed within Japanese Ki Culture and other artistic traditions of the East. Such disciplines support us in connecting hand, heart and Hara in sensitive, and globally responsive, spontaneous action. Let’s be clear. Global touch can manifest effortlessly only through conscious practice. The centre becomes established and the “ten directions” become available for us to explore in due measure. Just as rising and sinking down, advancing and retreating, turning to left and right, issuing, withdrawing, pressing and releasing, grasping and letting go, etc. are integral to classical Taiji forms, and spontaneously realised in such arts as…. say, Aikido and caligraphy, a corresponding practice is essential for inner connectedness and nuanced touch in the healing arts. The way of harmony is found by following others without losing one’s own centre. It is impossible to expand here on the various versions of the path, but it doesn’t matter. “The Tao is aimless, therefore it nourishes all things”. Seiki is a context where we can practice touching harmony for our common development in this extraordinary spirit of “nothing special”. 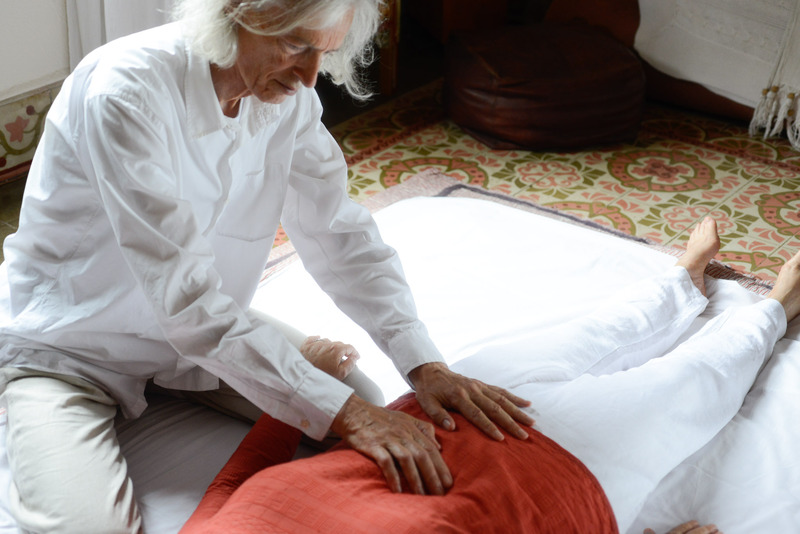 In Shiatsu we have often learned a particular version of “finger pressure therapy”, to apply pressure by bringing weight forward, leaning from the Hara, projecting Ki and so on, perhaps following also a certain pattern or diagnostic method. Whether we call it Zen Shiatsu or some other name is not important. If we really want to follow the open way we are called on to abandon our fixed position. We have no weight that can be brought forward, no Hara from which to move, and no Ki that can be sent. In the words of a Zen poem, “The wild geese do not intend to cast their reflection; the water has no mind to receive their image”.